Each 5 ml contains Sodium Alginate BP 500 mg & Potassium Bicarbonate BP 100 mg. Treatment of symptoms of gastro-oesophageal reflux, such as acid regurgitation, heartburn and indigestion (related to reflux), for example, following meals or during pregnancy or in patients with symptoms related to reflux esophagitis. Sodium Alginate and Potassium Bicarbonate is contraindicated in patients with known hypersensitivity to these. Adults and children over 12 years: 5-10 ml (1-2 teaspoonful) after meals and at bedtime. Children 2-12 years: 2.5-5 ml (2 -1 teaspoonful) after meals and at bedtime. In addition to the desired effect of the drug, some side effects may appear such as: nausea, constipation, diarrhea or headache. Marvelta should be prescribed with caution in patients with renal impairment and congestive cardiac failure. 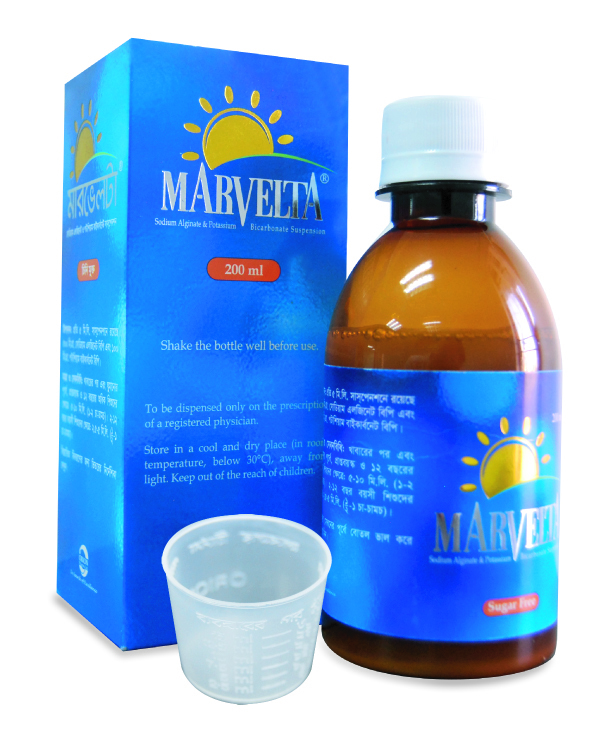 Use in Pregnancy and LactationMarvelta can be given in pregnant and lactating women. If you are taking other medicines concomitantly, or have just completed another drug treatment, inform your physician in order to prevent hazards or inefficacy arising from drug interactions. Each PET Bottle containing 200 ml of suspension.